One of my favorite Sunday morning activities is to watch the political talk shows. I follow politics in a similar way that people follow sports. Politics and democracy, for me, are spectator sports. Granted, I don't particularly like the "players" on either side but I do find it fascinating to watch. That being said, one of my favorite "democracy commentators" has been George Will. No one can take obscure, boring historical & political facts and spin them into laugh out loud punch lines. 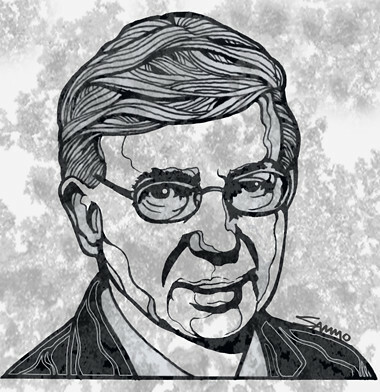 Anyway, here's a portrait of George Will that I finally found time to complete. Hand drawn line art on marker paper using Copic Mulitliner pens. Textures added in Photoshop.